Sometimes you don’t need to completely revamp your heating system and a simple boost is all it takes to reach the comfortable temperatures and cost savings you need. Our infrared heating systems are great for primary and supplemental heat and will definitely give your ductless heat pump, wood or pellet stove and , forced-air heating system the boost it needs. Ductless heat pumps are a great option for many heating and cooling applications. Although we do not sell or service ductless heat pumps, we know that they are a great option. In fact, we use one in our office, which have found especially useful for cooling. Some utility companies even offer credits and rebates for homeowners who install heat pumps. However, ductless heat pumps are often relatively limited in the space they can heat and it is not cost effective to add one to every room. A ductless heat pump mounted in the living room will rarely provide enough heat to auxiliary rooms that are farther away, such as bathrooms, bedrooms and kitchens. Our infrared heating products are a great compliment to ductless heat pumps because it is far more economical, not to mention easier, to install a small infrared heater in auxiliary rooms than it is to install additional ductless heat pumps. 1: Ductless Heat Pump – Excellent efficient option for heating and cooling large areas. Heat pumps are typically found in living rooms. 2: Radiant Heat Panel – Our Ducoterra SolaRay heating panels are great for complementing heat pumps. They mount out of the way on the ceiling and radiate sun-like-warmth to directly heat the room’s occupants and objects. 3: Cove – Our cove heaters are another good option for complementing heat pumps. They mount high up on the wall, making them ideal for rooms with high ceilings. Ductless heat pump installed at a Seattle home. Our radiant heating panels supplement the ductless heat pump. Our radiant panels are also used to add supplemental heating to the kitchen. I love them, they are modern and keep me warm and my heat bill low! The heat panel in my bedroom I turn on every night when it is cold. Since my bedroom is an add on, it's pretty hard for the heat from the living room to get to that area. Wood and pellet stoves are great for heating a single room, but they often lack the ability to distribute heat evenly throughout a home. Our infrared heating products work very well in conjunction with wood and pellet stoves because they allow you to mount heaters in rooms such as bedrooms, bathrooms and kitchens where the heat from the fireplace is not distributed. 1: Wood & Pellet Stoves – Good option for heating a single space, but they lack the ability to distribute heat throughout the home. heat the room’s occupants and objects. 3: Cove – Our cove heaters are another good option for complementing wood & pellet stoves. They mount high up on the wall, making them ideal for rooms with high ceilings. Forced-air heating systems typically consist of a heat source, such as a boiler or furnace, that pumps heated air throughout a home. This often results in uneven heat because the rooms that are closer to the heat source will get more heat than the ones farther away. 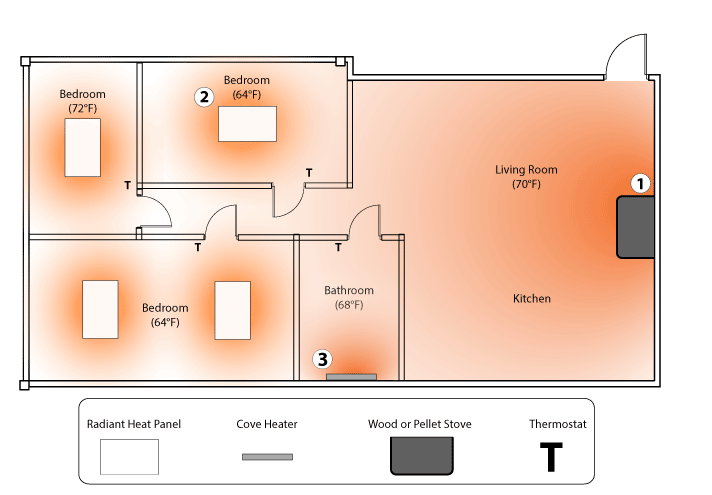 Additionally, the temperature is typically controlled by one centrally-located thermostat. Because of this forced-air systems inevitably waste energy by heating rooms that are not in use. Another downside of forced-air heat is the fact that warm air rises, which leaves your ceiling warmer than your floor. By contrast, our infrared heating systems heat people and objects directly, which results in a warmer floor and happy homeowners. Our radiant infrared heating systems can mitigate the downsides of a forced-air heating system. By using infrared heaters alongside your forced-air system, you can eliminate cold zones and also heat only the rooms or zones you’re using. 1: Forced-Air Systems – Vents are often found only in bedrooms and living rooms & heaters often do not sufficiently warm the home. the room’s occupants and objects. 3: Cove – Our cove heaters are another good option for complementing forced-air systems. They mount high up on the wall, making them ideal for rooms with high ceilings. – Great for decks, patios, workshops, garages, etc. Our thermostats offer the ability to heat a home room-by-room, conserving energy and saving you money. We offer both manual and programmable options to suit the needs of every user.